This icon is considered and honored as one of the greatest icon treasures of the world, showing forth the Holy Trinity as was revealed to the Patriarch Abraham and his wife Sarah in the form of three angels. St. Andrei Rublev painted this masterpiece in the early 15th c. for the iconostasis of Holy Trinity Cathedral at the Trinity/St. Sergius Monastery in Sergei Posad, Russia. The figures of Abraham and Sarah, always in previous icons of this sacred event, are removed by St. Andrei to emphasize the transcendent revelation to Mankind of the Infinite yet ever-present One Triune Godhead. May our voices ascend with his to God in heartfelt love! 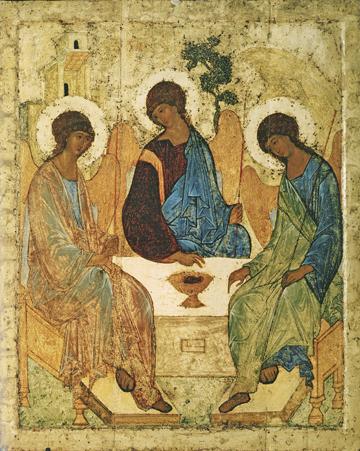 One of the chief interpretations of this icon indicates that the central angel represents God the Son, who with the angel on the right representing the Holy Spirit, turn their heads now inclined in love towards the angel on the left representing God the Father. Yet there is a perfect symmetry of form, showing consummate harmony and unfathomable depth. Luminous robes, majestic beautiful faces, and bright yet subtle colors illuminates this icon to turn our hearts to Heaven. O Most Holy Trinity, glory be to Thee!